In Judaism, a Bar Mitzvah is a Jewish boy, and a Bat Mitzvah a Jewish girl, who has turned 13 years old (or for a girl in the Orthodox movement, 12 years old). They go through a ceremony which symbolises the young person's responsibility for themselves. Before the bar mitzvah, the child's parents hold the responsibility for the child's actions. After this age, the boys and girls bear their own responsibility, and are able to participate in all areas of Jewish community life. It marks their coming of age. The terms are also used for the ceremony celebrating this event. 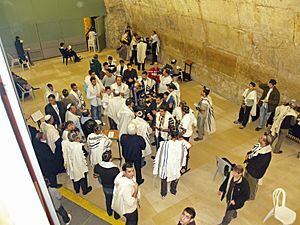 Bar Mitzvah (pl. B'nai Mitzvah) comes from the Aramaic בר מצוה, "one (m.) to whom the commandments apply". (If it were Hebrew it would be בן (ben) not בר (bar). בר is "son" in Aramaic, and בן (ben) is son in Hebrew.). Bat Mitzvah (pl. B'not Mitzvah) is בת מצוה, "one (f.) to whom the commandments apply" (Ashkenazi: Bas Mitzvah). According to Jewish law, when Jewish children reach the age of majority (generally thirteen years for boys and twelve for girls.) Then they become responsible for their actions, and "become a Bar or Bat Mitzvah". This is also the time when physical puberty normally begins. Before this the child's parents have the responsibility that the child follows Jewish law and tradition and, after this age, children have their own responsibility for Jewish ritual law, tradition, and ethics and have the right to take part in all areas of Jewish community life. Bar and Bat Mitzvah Facts for Kids. Kiddle Encyclopedia.